A complete account of the six novel series. The continuing blog and author site. 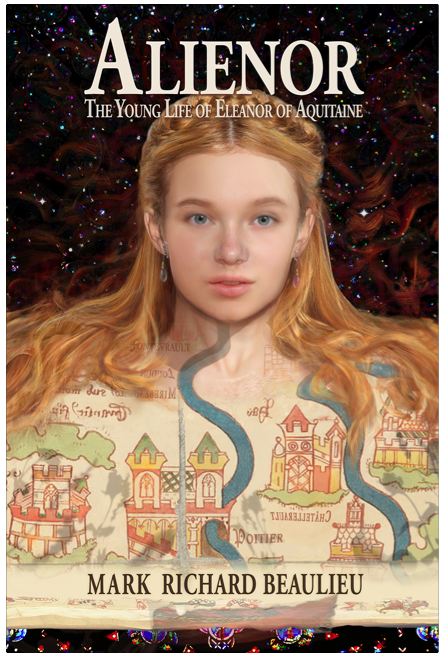 SAN DIEGO, CALIFORNIA – March 16, 2012 – Author Mark Richard Beaulieu announced today that ALIENOR – The Young Life of Eleanor of Aquitaine is available in print. ALIENOR – The Young Life of Eleanor of Aquitaine, is available in print from Amazon estore – 310 pages and a gorgeous cover. Also available on Nook and Kobo and Reader. ALIENOR is a historical novel taking a fresh look at the young life of Eleanor of Aquitaine. Set in twelfth century France, the story tells of how a complex girl and her interesting friends face a backward alien world, and how she develops the character that will make her become one of the greatest queens of Europe. This is book one of “The Eleanor Code” series. SAN DIEGO, CALIFORNIA – March 6, 2012 – Author Mark Richard Beaulieu announced today that the cover for his long awaited book set in the twelfth century, ALIENOR: Young life of Eleanor of Aquitaine is available for public viewing for the first time. Created by Mark Beaulieu, noted fine artist, the cover of Alienor imaged for 1137 was synthetically created in 2011 by a nine month generative process on a Macintosh using Photoshop. The face is a Caucasian thirteen-year old female, although to some she looks fifteen. Her hair is uncut and long. The strands are a mix of vital colors crimson and blonde. The hair starts as a thickly braided crown that runs over her shoulders and back. Her hair is tucked behind her bare listening ears. A few deep red waves float wildly in the dark behind. She wears drop earrings. Her dress is ambiguous, a burgundy-red stitch-work on cream-white linen, a map brought up to her neck. On her are drawn crayon color rivers and castles; some suggest tattoos. Two blue serpentine rivers suggest a feminine form; one crosses her vocal cords and stops at her chin. The castle-cities of Aquitaine have their legends spelled backward. Her capital city Poitier spells forward, as does Fontevrault by her right shoulder. Under Poitier, in a faint mist runs the rim of the scarlet satin guard of her red-horsehair belt. The rivers and castles come from the William Wey’s crusader hand map. The gray folds of its separation appear as either a sword hilt, or an upside down crucifix, centered on Poitier. The powerful story, which has 19 chapters and runs 300 pages, tells a compelling story about the life of an woman who will be the Queen of France and then England. The 1100s was a very long time ago, but recent scholarship on Eleanor’s life has changed the outlook of the famous royal leader. ALIENOR is a historical novel taking a fresh look at the young life of Eleanor of Aquitaine. Set in twelfth century France, the story tells of how a complex girl and her interesting friends face a backward alien world, and how she develops the character that will make her become one of the greatest queens of Europe. This is book one of “The Eleanor Code” series.The Book Alienor will be available in stores soon. Early fans can go to the Alienor web site is at http://www.eleanorofaquitaine.net/. You may purchase the book there.